I get asked all the time about breakfast and diabetes. It shocks me how many people don’t eat breakfast. And the big thing is, for type 2 diabetes, you should be eating breakfast. Maybe you’re on the go in the morning. Or you think that skipping breakfast is better than eating breakfast. Well I’m going to tell you why it is perhaps one of the most important meals of the day. And if you were to skip a meal, it shouldn’t be breakfast. In a nutshell, a big reason for breakfast is that it breaks the fast between dinner from the night before and lunch. If you don’t have breakfast in the morning it puts your body into a prolonged fasting state. Your body starts to believe you won’t be eating soon. And when you finally do eat, your body stores it as fat. And this leads to weight gain. It’s counterintuitive. Because I know many people who think that they will lose weight if they skip breakfast. Missing breakfast also put you at risk for low blood sugar, or hypoglycemia. Another thing that happens when you skip breakfast is you end up snacking more on those sugary, high fat foods, sodas and night snacks, all which lead to gaining weight. The bottom line is you make smarter food choices when you aren’t starved. Just think, what happens when you’re starving and haven’t eaten in a while. You’re more likely to grab some junk food. So for the reasons I stated above, I recommend that you to spread your carbohydrates out across meals and include breakfast. Instead of having one big lunch and a huge dinner. 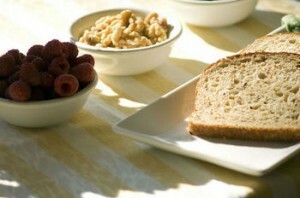 The best breakfast is low in carbohydrates and fats, and high in protein and fiber. Try to get 7-10 grams of fiber with your breakfast. The key is to mix protein, carbs and fiber. And most important, make sure you’re checking your sugar to see how different breakfasts affect you. The key is nutrient dense whole foods that make you feel satisfied and provide you with energy. If you’re still struggling to figure out the right mix of meals to conquer diabetes you need to grab my Master Your Diabetes Program. In Master Your Diabetes you’ll learn how to put dieting out of your mind for good and start living and controlling diabetes like never before.